M.C. 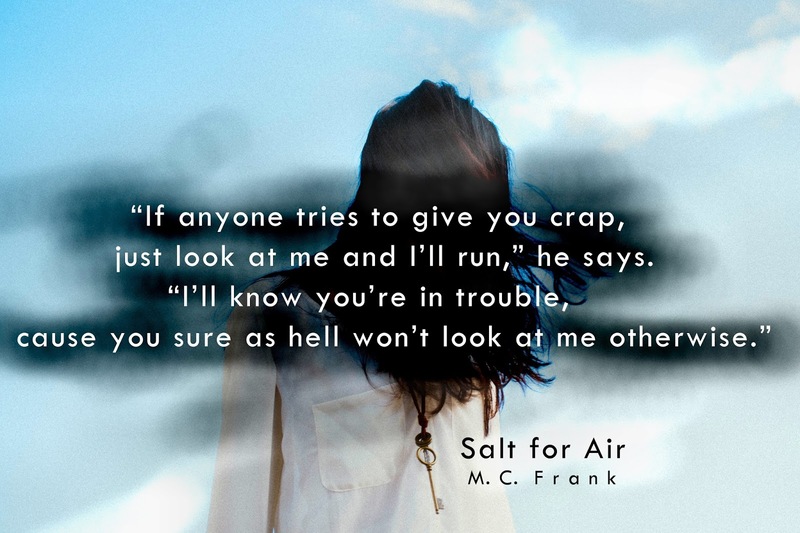 Frank: Salt for Air - the first chapters! 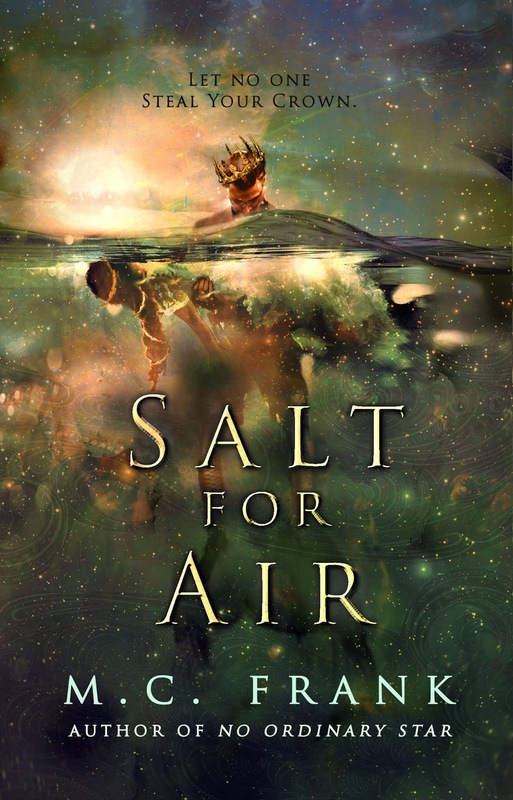 Salt for Air - the first chapters! One day, the bullies go too far. They try to drown her, but at the last minute an otherworldly creature shows up in the water. He keeps her breathing and tells her to live: "How will you be able to save anyone if you can't even save yourself?" 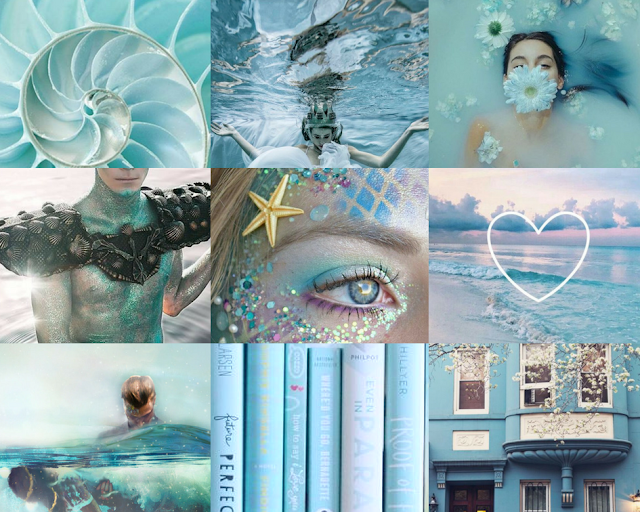 She thinks it was a dream, but the emerald-eyed merman boy who rescued her appears in her school the next day. Is he really the exiled prince of an ancient kingdom that's on the brink of utter destruction? And is he asking her to save him? Or is something far more sinister and deadly lurking in the water that surrounds her little Greek town? Did you know that when someone is bullied, they’re forced to become a different person than they would have if they hadn’t been bullied? Distrustful of people, clammed up in themselves, always doubting their own worth and strength… You’re basically robbing them of their true future self. The voice sounds impatient and mad. But mostly it sounds disgusted -as though it’s exasperating to whoever is speaking that I should be dying right now, when it’s clearly so inconvenient. Now, there are all sorts of things wrong with that sentence. One. I can’t breathe no matter how I focus, because my face is shoved inside a toilet and there’s a hand pushing my neck in so no matter how much I thrush and kick my legs and wave my arms around the porcelain bowl, water keeps filling my nostrils, choking me. Two. I shouldn’t be able to hear someone speaking to me through the freaking toilet water of the girls’ bathroom. Three. There shouldn’t BE anyone in the freaking toilet of the girls’ bathroom. I’d lift a hand to scratch the place where his breath had touched, because it tickled. He’d burst out laughing and do it again. He’d nothing to say to that. He knew what was going on at school, well, not everything, cause I didn’t tell him, but he could tell when I came home all red-eyed or with my shirt torn, or, once, my skirt doused in cooking oil. Today, if I was to get home at all, it would be my shirt and the top part of my pants that would be drenched by toilet water. But my dad won’t be there. Nor will I, apparently, because it seriously looks like I’m actually dying here. Drowning in three inches of water. 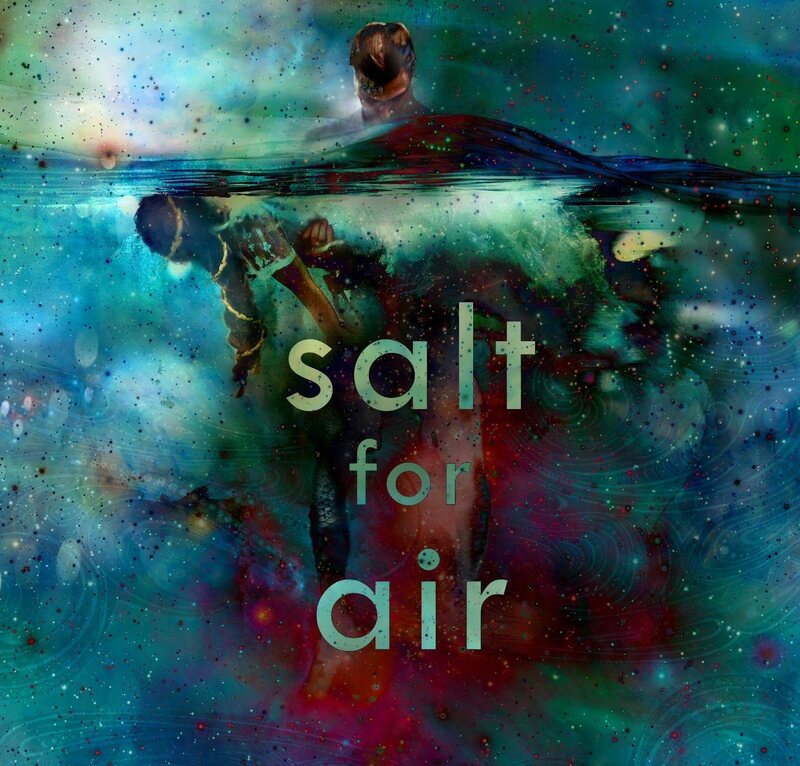 My lungs constrict, heaving in a breath that’s full of acid water, and I splutter as it choked me. My eyelids drift shut, blurring the image of a pair of brilliant emerald slash aqua eyes that are staring at me frantically. My arms flop helplessly to the sides. What’s the use? The emerald eyes are a figment of my imagination -in fact, they look like they’re something I wrote up in my fanfic, Mer Force- so what does it matter? As for Marilia and her gang, well, its’ pretty obvious, isn’t it? They’ve won. After ten years of bullying and pranks and circulating false rumors and ruining my homework so that I’d get an F, they’ve finally killed me. The water-voice, the one that belongs to the person with the emerald eyes, who shouldn’t be here in the toilet water, and who shouldn’t be able to speak through water either, yells at me so loud it wakes me up. I force my eyes to open one last time. The eyes come closer. Do all people see the boy they’ve been dreaming (insert writing) about in their final moments on this earth? No, they don’t, don’t be stupid, Ellie. That’s Lydia’s voice in my head. Lovely. Get out of here, I want to focus on fanfiction boy. Because it’s certainly him. In my muddled brain, he looks almost exactly like the actor who plays him on TV: the warrior from Mer Wars, the merman who wears a breastplate made from radioactive algae and rusty metal salvaged from shipwrecks on his one shoulder and an obnoxious smile on his gorgeous face. Which said gorgeous face, is now wearing a disgusted expression as he leans upwards and presses his lips to mine. breath -of what? water? Toilet water? This fic is getting out of control, my tired brain thinks, feeling a bit better now that I’ve sort of been kissed by my own fanfic hero inside a toilet bowl. Yep. Definitely better. With a final effort I pull my face out of the water, trying to take a shuddering breath, but I’m pushed in again so violently my forehead cracks on the porcelain. My nostrils are burning as I inhale more water. The emerald eyes are fading in front of me. He fits his lips to mine, and this time I sputter and cough because air, actual air entered my lungs. “What the hell?” I try to say, but all that comes out is bubbles. The emerald eyes crinkle with laughter. “My thoughts exactly,” he says as he gives me his breath once more. I want to say, upfront, that this isn’t going to be a romantic story. It is going to be a story of love, but not the kind of love you’re imagining, perhaps. There will be no shipping, no fangirling (except my own, and that’s kind of pathetic, you’ll see) and no mashing together of last names. This is a story of sadness. Of death, of loss and of going slightly mad because of them. Also, of girls’ bathrooms. There’s going to be a lot of that. So be prepared. If you need to picture me somewhere, don’t try any of your usual young adult novel tropes. No high school cafeterias, no gloomy North American suburb where it usually rains; not even one of those two-storey homes with large, white-panneled windows and an attic out of which teenage boys can climb after peeking in just to make sure their favorite girl is sleeping safely (and prettily). My life couldn’t be further from my beloved ya novels. You see, I live in a place you haven’t even heard of. Have you ever heard of Greece? It’s that little country by the Mediterranean that’s been sinking in debt. It’s also the country of Homer and Athena and Plato. Some of our finest poets said that its every river is steeped in history, every mountain-top bathed in legend. I don’t know if that’s true; what I know is that in the last five years of his life, my dad had to work three jobs just to keep us both clothed and fed. Also, that it cost every single euro that he left me in the bank to pay for his health insurance. Yeah, in case you didn’t know, things are tough here. Our tiny two-storey house in Piraeus, right next to the harbor, with the lace curtains and the little yard at the back, had to be rented out, just so that I could pay our taxes and the doctors’ fees. I doesn’t matter. I wouldn’t have been able to stay there on my own, anyway. I moved in with Lydia and Jimmy, our neighbors whom I’ve known since I was two. They’re good people, but they’ve got their own lives. And it’s not like I’d want them to take the place of my dad. It’s not like we can be family. No one can. Not after my dad. I went to a tiny Primary school in a small neighborhood near the sea, where we all woke up to the hog of the departing ships at five o’ clock in the morning, then fell back to sleep until eight. The bell rang at a quarter past. There were few kids, and I the weirdest among them. I was oddly dressed and sad and my dad was single, plus he had a scandalous story concerning his former wife trailing rumors behind him wherever he went. I was bad at sports, I was chubby (from third grade to sixth) and I had my nose always buried in a book. I wasn’t an orphan, but I was abandoned. I was the result of a tragedy, but also the result of a crime. I don’t know if you are aware of how those small, ‘close-knit’ communities work. The tiny neighborhoods where everyone knows everyone’s dirty laundry. They always need a victim, someone to pick on. And for want of someone more deserving, I got chosen. I was the easiest target. That was my only crime. It’s followed me since pretty much day one, and it’s been getting worse every year. Being alone and lonely is part of who I am. Not that I’ve got time to be lonely any more -not since I discovered books. But you know how it is. Chances are, if you’re reading this, you’re a reader too. So no need to talk any more about how books rescued me. They probably rescued you too. They are rescuing me every day. We don’t study Shakespeare and the Brontes where I come from; its nothing like it is in all the young adult novels I read. We’re taught Greek mythology and the Odyssey. We study Achilles and Helen of Troy. No, I know what you’re thinking. It’s not exciting; it’s not cool. It kind of gets boring after the one hundredth and twenty-seventh test on how many columns there are on the Parthenon, you know what I mean? Also, conjugating irregular verbs in ancient Greek. We do a lot of that, as well. I hate it. The first thing I did after my dad died was to go look at my face in the mirror. Well, the second thing, technically. The first was plan the funeral. I sat on the kitchen table, the lamp bathing the room in a painfully yellow glow -it was night by the time I got back from the hospital- and called the funeral parlor. I had to arrange everything, pay for the casket, book the church, that kind of stuff…. There was nobody else to do them, you see. Then I got up and went to the bathroom. I stood in front of the mirror. I wanted to see if anything had changed on me, maybe some mark appearing on my forehead, marking me as someone who has seen death. I was sure that half of my hair must have turned white or, at the very least, that there would be wrinkles around my lips and eyes, as though I’d aged overnight like the cursed maiden of an evil fairytale. Of course, there was nothing like that in my reflection. If I looked closer, I’d see the empty look in my eyes, the bitter lines around my lips, the little hairs on my neck standing up as though I was cold, even though it was a warm May night. But I didn’t. The second thing I did was to upload the fourth chapter of my Ever After Upon a Time (or EAUAT, for short) fanfic, “Mer Force”. It’s based upon the TV series, like all fanfiction is, but with a major twist. More on that later. I remember I wrote a brutal scene of a battle between the mer people who were led by Oceanus (who, as aforementioned looks freakishly like Emerald eyes, by the way, he has green eyes and floppy hair) and some weird shark-like creatures -the battle scene turned out awesome. It wasn’t canon, of course, but who cares? It was for me. 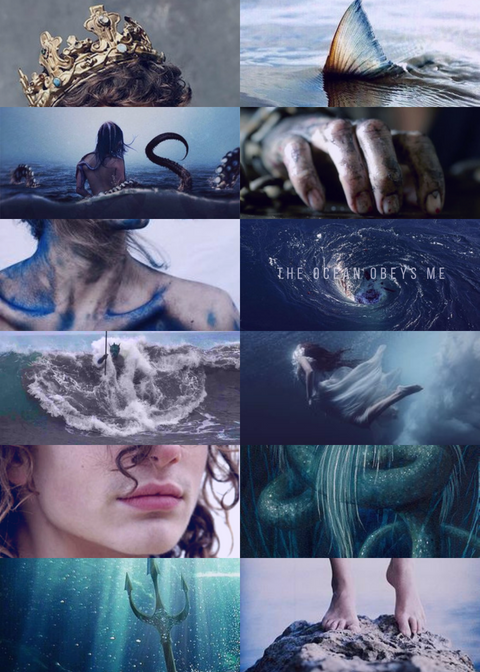 There was blood spurting everywhere and mixing in with the sea water and monsters with tentacles and snakes for hair (Greek mythology-inspired) choking humans and all sorts of fun stuff. Oceanus and his mer-soldiers of course destroyed every human in sight. I don’t remember much of what I wrote, and I haven’t reread it since, but that was what started the popularity. Suddenly every fanboy or fangirl who had a thing for gore eventually found their way to ‘Mer Force’. There were so many comments asking, no, begging for battle scenes, saying that EAUAT had never been one of their favorite shows because of all the fairytale characters and the drama and romance, but they devoured my fanfic like crazy. So, I gave it to them. I wasn’t much in the mood for family drama or true love’s kisses anyway. Of course, all the EAUAT fans just loved reading all the bare-chested Oceanus scenes anyway, so they were coming to my fanfic by the scores as well. Which was why I ended up in the toilet in the first place. Well, I should add at this point that it started with the fanfiction, but it certainly didn’t end there. It was youtube that destroyed my life, in the end. By ‘there’ I mean the videos. Nothing complicated, just a few shots of the sea that’s half a kilometer from my house, the sound of water lapping against the docks, along with my voice reading my fanfic aloud (kind of like a voiceover, I added the reading later). That’s it. Then I uploaded the first chapter on youtube. As I said, the vidds (there were two of them, all in all) were really simple. For the second one, I just recorded my voice along in my bathroom, with the bathtub filled with water, my hand just moving gingerly in it as I read to create water sounds. I couldn’t be bothered to go to the docks. When the idea had first coame to me, I thought it was so simple and easy, it was genius. Of course, without the videos they would never have thought to push my head inside a toilet. As I said, genius. Pure genius. It took two months for someone in my class to discover my videos. Then the name-calling started ‘mer-girl’, ‘wet-girl’ and even ‘toilet girl’, right before the idea struck them that it would be fun to drown me in one. I’ve always been called a nerd and a geek and lame and stuff like that at school, because I was one of the lucky ones, born with pale skin and no muscles and no inclination for working out or being super social or fashionable. My family was working class forever and became borderline poor while my dad was having chemo and treatments, for two and a half years before he died -also, because of the crisis in Greece, but I won’t bother you with that. But no one has ever called me crazy, which is what they should have, if they’d known what’s happening to me as I’m dying right now. And it’s not just the vision of Oceanus or hearing his voice through the water. It started yesterday, at home. One day, just two weeks ago, I had just finished taking a shower, during which a creative wave had hit me, and I was preparing to fill the tub in order to record another chapter for my youtube channel, ignoring Lydia’s yells from downstairs to get dressed and run over to the deli, (most probably because Jimmy, her long-term boyfriend, was out of cigarettes or something else of equal importance) when I heard it. Something splashing in the water. Now keep in mind, the bathtub wasn’t filled yet. I was just stepping out of the shower, and the showerhead was still dripping on my hair, the walls damp, shampoo-smelling steam rising towards the ceiling. And just as I was slipping my bare left foot into my fuzzy slipper, I heard that sound coming through the pipes: something splashing in water. I didn’t think much of it until a few minutes later when, dressed in sweaters with my hair swaddled up in a long towel, towering above my head, I came back to turn the tap off, because by this time the bathtub would be half-way full, and that was enough for what I needed to record. As soon as I stepped inside the bathroom, I stopped short. There weren’t any splashing sounds this time. Or if there were, I didn’t notice in my panic. Yes, panic. Because the water was pink. I stifled a scream and rushed to pull the plug off. I don’t know what I thought had happened, if the water had come dirty from the pipes or what, but the truth is I freaked out because only one thought popped in my head as soon as I saw the color of the water, was diluted blood. That’s exactly what it looked like. Anyway, I just sort of stood there, my eyes bulging out, and waited for the water to drain, certain I was seeing things. As soon as the last rivulets were flowing towards the drain, I clearly saw on the bottom of the bathtub two bloodstains. They were small, but so thick that I had to point the showerhead on them with full-on hot water for five minutes until they dissolved. I wasn’t touching that thing. And when I picked up the little drain-thing to clean it, just as I do after taking a shower, there was something stuck to it. It looked like a piece of plastic and it was sticking out at an angle, but when I touched it it was razor-sharp, almost scratching my finger. It was an iridescent, pink and purple and orange, fish-tail scale. I’m going mad, there’s no other way to explain this. If I’m mad, and he a figment of my imagination, are these the best lines I can give him to say to me? I’m pathetic even in fiction. Before I have time to freak out at his mentioning my name, suddenly the pressure on my neck slackens a bit and I shoot up from the toilet, gasping and coughing out water with so much force a piece of my lung must come up too. Water runs down my chest, all over my clothes. A tinny sound of laughter bounces off the doors as they swing closed behind Marilia and her friends’ retreating backs. Their steps echo in the hall as they run away. I try to stand up and drop back to my knees, hacking up more water. My throat is burning and my hair is plastered to my forehead, dripping into my eyes, mingling with my tears. I put myself together as best as I can and wait for the bell to ring for second period before running to the nurse’s office. I tell her I wasn’t feeling well and wanted to put water on my face, but I had an accident. She looks at me with pity and understanding in her kind eyes -this is definitely not the first time I’ve come to her in a similar situation. I walk home absent-mindedly, shivering through my clinging shirt in the autumn chill -school started barely a month ago, there’s still months and months of it- turning the questions over in my mind. What the hell happened to me in there? I reach home unnoticed, with no better explanation than that my mind finally snapped and I’m imagining my fanfic is real. I take a hot shower, crying huge, silent sobs into the waterspray, all the while refusing to acknowledge the most important fact of the day: the minutes I spent pushed inside the toilet, unable to breathe were far too many to have survived on my own. I have to be honest, when I started the 1st chapter, I'd thought it was another one of those generic YA romance, fangirlin' and shipping but wasn't so sure by the starting of the second chapter, I had almost believed that the author was telling her own story and by the end of the last chapter, girl, did you shatter mu presumption about the generic part. I especially like the writing, didn't experience a single hitch as I cruised down paragraph after paragraph and before I know it, the post ends. I am so going to read the whole book once I'm rid of my exams. Keep up the work MC Frank, you have a great writing style and are backed up with fresh plots, I really hope this book gets published! -- Jayana (jayana.jain98@hotmail.com) and not the email address with which this comment has been posted.